Any casino game has a house edge, and roulette makes no exception but understanding exactly how high it is compared with other games can help players calculate their chances of winning. Essentially this concept is defined by the average defeat to an initial bet, and the idea is to focus on games that keep this percentage as low as possible. Roulette is hardly one of the casino games that carry a low house edge, with the Blackjack leading the pack by keeping the figures below 1%. 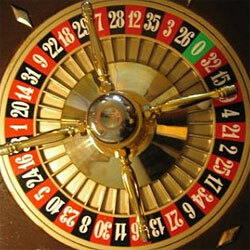 For those who decide that they intend to play roulette the best thing that they can do is to choose the European roulette over the American one. There is a single difference between the two wheels, and it consists in the fact that American roulette has an additional slot marked with 00. Whenever the ball lands on this slot, old wagers except those made in 00 are lost, and this is enough to double the house edge. The European roulette has a single zero and the house edge is 2.70%, while the American version has such unlucky slots and as a result the house edge is 5.26%. This applies to all wagers except for the five number bet which is the worst possible wager that a roulette player can choose. It carries a house edge of 7.89%, so it should be avoided at all costs, especially with the payouts being as low as 6 to 1. Another thing worth mentioning about house edge, is that it is relative to the initial wager so players will have an easier task of estimating the amount they will lose. Essentially a house edge of 2.72% implies the fact that in the long run a player who makes an original wager of $100 will lose an average of $2.72. By knowing these figures, players can adjust their wagering strategies, so that even during the lengthy losing streak, the total amount lost will be kept bearable. Although knowing the percentages of the house edge for different casino games is important, the figures shouldn’t be overestimated. An American roulette and Caribbean stud poker have a similar house edge, but the ratio between money lost and wagered can differ significantly. Furthermore, the house edge can be calculated by taking into account or ignoring ties, which explains why there are differences between people and websites calculating the house edge for different casino games.